Miami shoe designer Marcus Rivero goes by the name Soles By Sir. Rivero said he fell into the shoe design business when he wanted to come up with a unique Valentine’s Day gift for a girl he was dating. She posted the shoes he designed on Instagram, and that’s when Miami Dolphins player Nolan Carroll found the photo and eventually asked him to create a pair. It’s a process that takes several hours for each shoe. Rivero’s team preps the shoe by stripping it and taking out the shoelaces. Players will give Rivero an idea of what colors and design they want for the shoes, and he hand-paints each one. 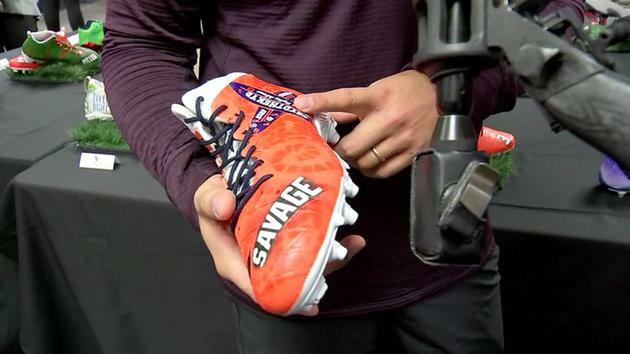 Over the last five years, he said he’s designed custom cleats for nearly 900 athletes, including some of the Houston Texans players. EMBEDMORE NEWS VIDEOSTexans showcase their My Cause, My Cleats for the weekend. Rivero said Texans wide receiver Braxton Miller’s cleats took about 10 hours. “He had a crazy shoe. He wanted Simba. In the five minutes we spoke, it kept getting crazier and crazier,” Rivero said. Miller dedicated his shoe to the American Heart Association because his father went through two open heart surgeries. Rivero said it’s special being a part of something that will help so many charities. He said he still can’t believe he’s getting paid to design cleats for his favorite athletes. “You know, I’m a fan like most people. I watch them on TV every Sunday and Monday night. When I meet them, it’s like ‘Wow I’m a big fan.’ And then I have some of these people tell me, ‘Well I’m a fan of you.’ It’s surreal to me. And to have this opportunity to have the NFL, and then the teams like the Texans reaching out, it’s beyond a dream come true. It’s incredible,” Rivero said. Rivero has designed shoes for some of the biggest names in sports and entertainment.